I have a bipolar appetite. Growing up in a Filipino household, I resisted eating a lot of traditional food in an effort to become more Americanized — something my mom consciously decided to do once she started to speak to me in English from 3-years old and on. Now married to someone that didn’t have the same experiences as me, I find myself wanting to revisit dishes and find comfort in them as the holiday approaches, namely anything with rice like arroz caldo. Arroz Caldo is known by many names: congee, juk, burbur or rice porridge. 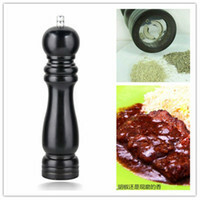 Considering it’s a fairly simple dish with rice and chicken as the main components — it’s the extras that sets it apart. In the case of arroz caldo, the addition of pungent fish sauce (patis) and minced ginger give it an added zing. I swear to you that the fish sauce doesn’t add any undesirable “fishy” flavor to this dish. In a typically bland dish, the fish sauce and ginger add depth and complexity. Arroz caldo is a “stick to the ribs” type of dish that hangs with you on cold days. My grandmother’s recipe usually included a few soft-boiled eggs nestled among the rice. Rice and chicken. What more do you need do you need on a cold, rainy night? Maybe a DVD of Breaking Bad season 2 perhaps? The dish starts off with browning chicken thighs in a heavy bottom pan. 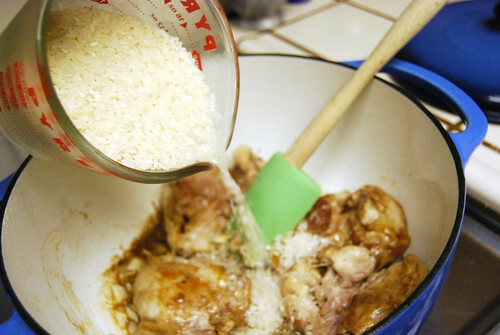 Once the chicken is browned, minced garlic and fish sauce is added. Rice is added a few moments later with ginger and mixed until the rice is coated. Chicken broth is added and the pot is topped with the lid. Check in every 15 minutes until the stock is absorbed by the rice. 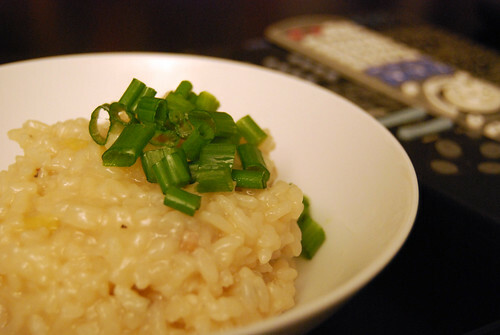 The dish is done when the rice is soft and tender (think risotto consistency). Topped with green onions and a bit of soy sauce, the one pot meal is complete. The addition of eggs is entirely up to you. Heat olive oil in heavy pot or dutch oven over medium heat. 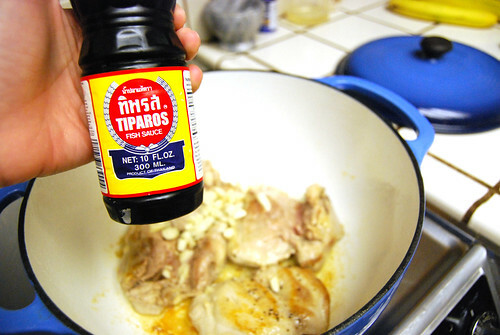 Brown chicken thighs in olive oil. 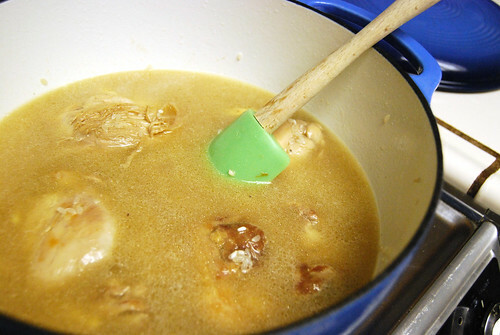 Add garlic and fish sauce to pot after chicken thighs have been turned over to brown other side. 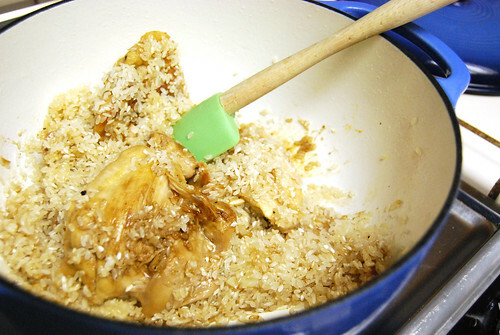 Add rice and ginger, making sure to coat rice with fish sauce, garlic and ginger. Raise heat to high and pour in chicken broth. When broth boils, reduce to medium low and cover pot with lid. Check pot every 15 minutes and mix rice, making sure that it doesn’t stick to the bottom of the pan. Add water if necessary if liquid is low. Arroz caldo is finished once rice is tender. Shred the chicken thighs prior to serving and top with green onions and fried garlic if desired. arroz caldo is definitely one of my favorite comfort foods. my mom would make it whenever me or my siblings were sick. it was also a traditional new year’s even dish for us. i also like to add fried minced garlic and sliced green onions to my arroz caldo. i make mine with wings. I remember being served this on New Year’s Eve too! I need to fry some garlic so add it as a topping. My mom made this for me when I was sick, too! Hah! Arroz caldo is a well known elixir in my Filipino households.